Marakei Island in the island country of Kiribati near the equator in the Pacific is a small atoll with an emerald green lagoon. The airplane dance tells the story of the WW II Invasion of their island. 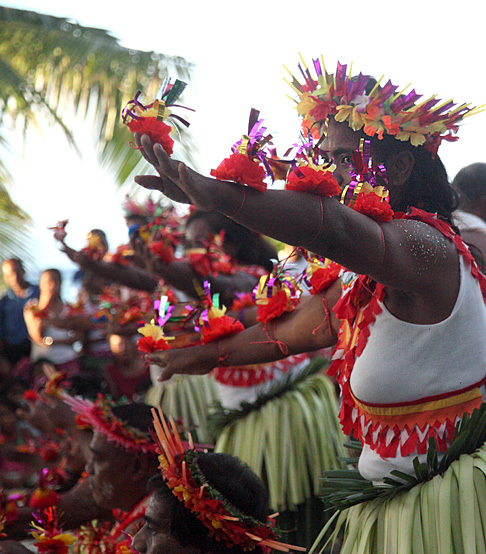 Dancers imitate the frigate bird in their style. Dancers often entrance themselves, and must maintain composure throughout the dance. This specific dance and style is only seen on the small island of Marakei. We originally planned to view from Butaritari. The craft we originally chartered was a catamaran which was stated to move at approximately 30 knots. After our charter was in place, it was disclosed that the ship only made 12 knots. 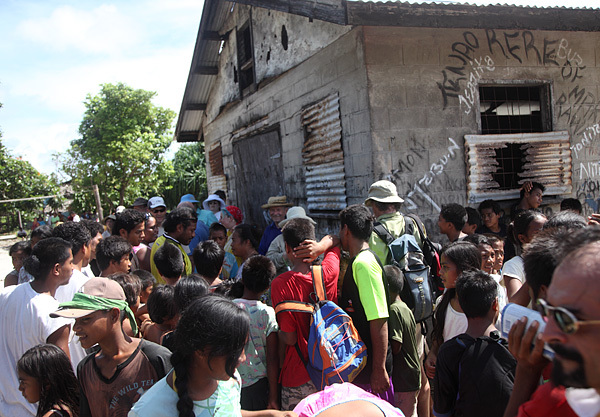 We then had to drop our expectation of reaching Butaritari within the travel window provided by the only available flights in and out of Kiribati, as well as in concern over safe shelter for clients aboard the ship for an excess of 30 hours at sea. 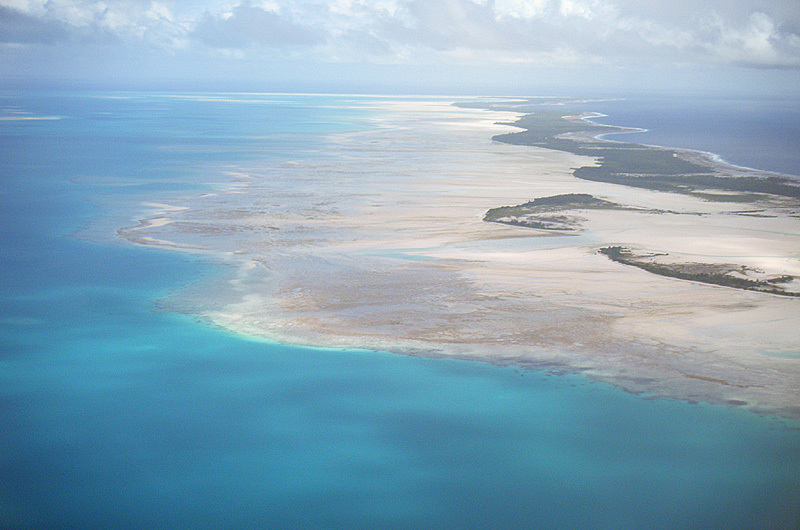 We instead chose to relocate our goal to Marakie island for concern over client safety and comfort. When offered the supercarrier which operated at nearly the same speed, we opted to move to the Supper carrier for its superior deck space and because of concerns of the mechanical condition of a ship unable to operate above 1/3 of it's operative speed. 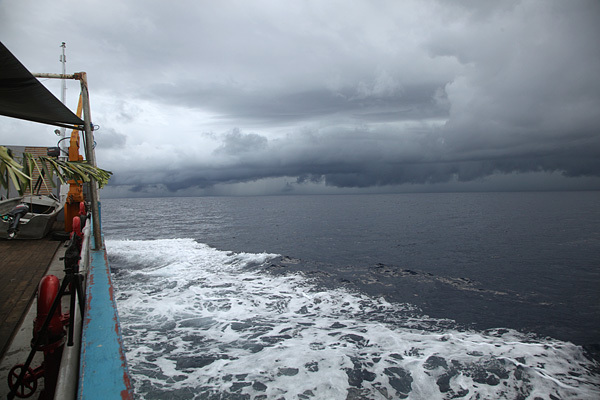 As weather data suggested the cloud structure on eclipse day was likely to be scattered, fast moving clouds throughout the entire region, our boat transportation to Kiribati was always to be a consideration for possible relocation if clouds loomed. We boarded the MV Supercarrier at approximately 5am and departed for Marakei island with an average sailing speed of 7 knots. We sailed up the western coast of Tarawa, then passed south of Abiyang. We carried BGAN satellite modem equipment and checked weather several times in the morning. We built the website, www.eclipsewx.com where our server downloaded raw high resolution weather data directly. A server-based program cut images into smaller, more manageable components for each viewing location, then generated animations of each data set. Clouds appeared to be moving from east to west, and the imagery suggested we were to pass through two sizeable outburst between Tarawa and Marakei island, but clearer skies existed to the east of these two main cloud formations. We had invited local ministry of meteorology aboard on the expedition. The chief meteorologist examined the images and agreed, but suggested a dog-leg pattern could bring up the south edge with a northern flow. He offered access to their academic data source, but we found it to be in lower resolution than our information. We did, indeed encounter two storms at sea between Butaritari and Abiyang. One was rather severe and caused us to slow to a stop and re-adjust our shelter's riggings before we could continue on to Marakei. Driving into the oncoming storm gust with our open-faced tarp acting like an air hood caused it to break free and act as a huge sail. There was a lot of scrambling on deck to protect any gear from rain, and to keep the huge tarp from flying away. It was exciting. Soon enough, this storm passed as we expected it to and we continued on at maximum speed. Our weather was still very worrysome. We watched the clouds come up, grow, change, dissipate with little or now pattern or flow. We could see two issues, with high cirrus clouds which looked to be absent in the east, but a lower cloud deck formed off the ocean's heat and humidity were completely unpredictable. The local weathermen had no insight to suggest how to predict them. We chose to put in at marakei and see how weather developed before the eclipse. The boat debarked its tenders about 12:30 and we agreed to make a decision to move or stay by 1:30pm. The equipment stayed on the ship so we would only move once if we opted to stay rather than twice if we brought it, then decided to go. On Marakei island, the entire island population greeted us at the shore. The mayor of Rawanawi spoke perfect english and welcomed us from the tenders. There was a great deal of mass confusion and chaos on Marakei. Our hosts had hoped to provide us with the obligatory tour counterclockwise around the island in keeping with island tradition for each visitor since pre-colonial times. However, the logistics were too difficult to navigate the enormous crowds or hope to bring our 40-50 guests on the 45 minute trek in 2 little pickup trucks. Our weatherman wasn't able to reach the office before 1:30 to learn anything new. The latest satellite image was not available to download before 1:30, so we made an on-the-ground assessment about the sky condition. A high cloud anvil was blowing off of the storm we passed to our east, threatening our western area where the sun would move. We also saw a lot of west moving clouds moving in on the island from the east. We decided the conditions were just too risky to stay ashore and moved everyone quickly to the ship with a promise to the mayor that we would return after the eclipse. We boarded and left our tenders at the island, taking out just at first contact. We moved east past the northernmost tip of Marakei island. The missing tenders left us with more deck space to erect equipment. Our associates with the meteorological ministry controlled the radios to the bridge. We then asked the chief weatherman to navigate with the captain in order to aim for an open break in the clouds. We arrived to a clear hole with the last puff of cloud passing away during 2nd contact. We had perfectly clear sky throughout totality. The ship moved in orientation between 1st and 2nd contact, so we couldn't use any kind of traditional tracking mount. Some guests used gimbal mounts. Others used alt/az mounts. Some people just hand-held their cameras. The moon was significantly larger than the sun. We saw no naked eye prominences during totality, since the moon was so large and blocked any small prominences. Later, we found some small prominences in photos. The streamers were very long and oriented almost completely east-west (up and down from our point of view). It was hard to focus cameras or binoculars on the eclipse because the lack of inner corona seemed to look blurrier than other eclipses. The corona was blue-grey in color, but only very faintly blue. One observer took a moment to look back to Marakei, which he saw under clouds. Our duration at our final position was 4:07. Just after diamond ring was over at 3rd contact, another light cloud came in. It was a pure nail-biter for the group. 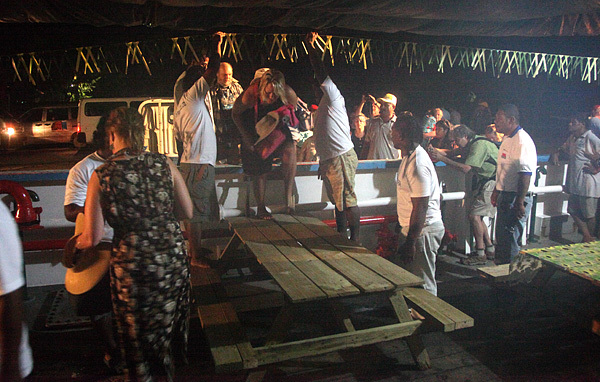 Between the storms and the debarking, chaos on the island and jumping back aboard to race into a hole at the last minute which lasted the exact duration of totality was a real thrill. We had a few minutes to share photos and hugs before we made it back to Marakei. 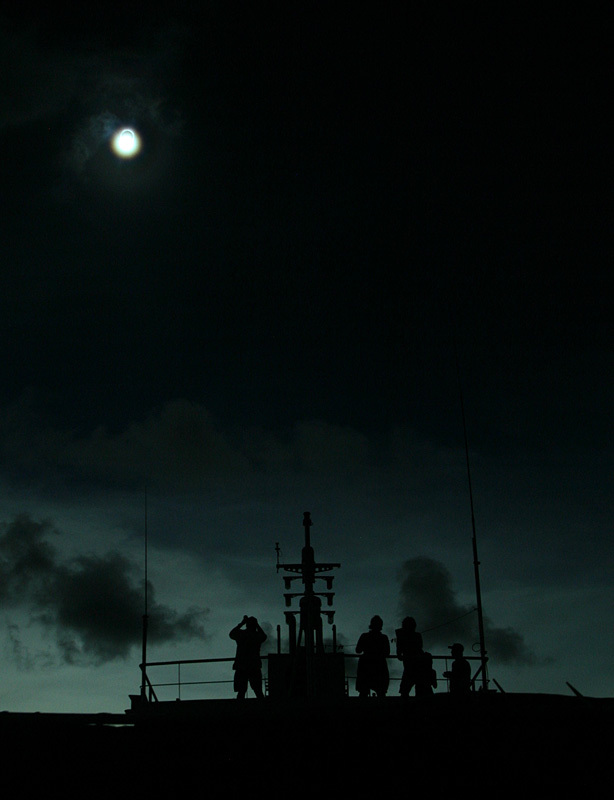 Our captain warned us that we needed to be underway by dark, so our time was limited on the island until sunset. This time, when we debarked, everyone knew to head strait to the waiting trucks. The mayor had a prompt program organized for us and a ceremonial counterclockwise walk around a spiritual monument so we could enjoy a visit with the population and a dance. We were offered gifts of coconut milk, crowns of flowers and handmade hats while the dancers of Marakei showed us their special dance. This island is specifically known for its style of dance which mimics the frigate bird. They dress in elaborate sashes and headdress and display Polynesian style story-telling in dance, but in a fierce and darting head and arm movement. The dance is done with great passion and dancers entrance themselves to the edge of collapse. Music and accompaniment for the dance is organized by the rest of the town seated behind the performers, beating on a large wooden square as a drum while singing. We watched several dances including one called the 'airplane dance' which tells the story of the WWII attacks on the island, and were invited to dance with the young ladies of the island before it was finally time to go. When we parted, we found a little group of kids swimming and splashing in the water at our departure beach. A few from our group threw off shirts and dove in to play a little while waiting for the boats to take us back to the ship.